As an option for those who want to enjoy an unforgettable trek from Kathmandu to the Everest Base Camp at 5,500 meters above sea level, we offer the possibiity to join the Extreme Everest 8850 Expedition since the arrival in Nepal for the first 2 weeks. Travel from your home country to Nepal. Paperwork. Visiting Hindu and Buddist temples and other local attractions in Kathmandu. 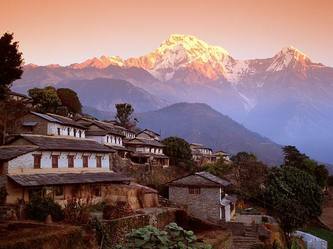 Today is a rest and acclimatization day in Namche Bazaar. Namche is a colorful village with many wonderful and interesting shops and vendors, fabulous food, and stunning views of the surrounding mountains. An early hike above town, before the clouds move in, reward climbers with a spectacular Himalayan sunrise and views of Mt. Everest, Lhotse (the 4th highest peak in the world), and the beautiful Ama Dablam. On the way down, we can visit the Sherpa Museum that houses an exhibit on traditional Sherpa lifestyle and a fabulous photography display by a local Nepalese naturalist. One room highlights the Sherpa traditions and in another, Sherpa high altitude climbers are presented. Today’s trail continues along the lateral moraine of the Khumbu Glacier and passes by stone memorials for climbers who have perished on nearby summits. After an early morning start, we ascend Kala Pattar (18,720 feet / 5,700 m) and enjoy famous views of the Himalayas, without having to climb Everest! That evening we camp beneath Kala Pattar at Gorak Shep. In the event of bad weather, we have the opportunity for a second chance to climb Kala Pattar. 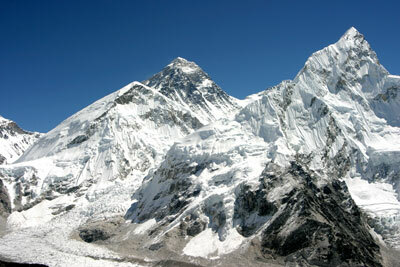 Today we will also continue our trek to Everest Basecamp, located at the foot of the Khumbu Icefall. We’ll spend the day at Everest base camp, giving you a chance to meet the climbers and thoroughly explore the area. Overnight in tents at base camp. In the morning we will enjoy tea and breakfast while taking in the view of Everest before leaving for our descent. We head down the glacier and return to Gorak Shep, our last night high in the mountains. This is a 5 hour walk from Gorak Shep to Pheriche. 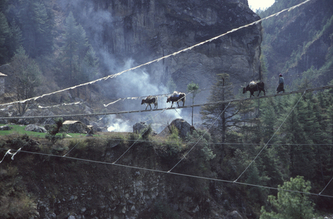 Today we trek back along the Dudh Kosi River through a magnificent rhododendron forest and past brilliant waterfalls. Shortly before reaching Namche, the trek takes us through a pine forest, where musk deer often graze in the early morning. Arriving in town, we may see lowland porters, highland Sherpas, and Tibetan people trading food and supplies during Namche’s market time. Trek from Namche Bazaar to Lukla where we spend the night. If the weather is clear, the morning flight back to Kathmandu will be a scenic and smooth farewell to the mountains. In the morning, we can watch Kathmandu rise in prayer along the banks of the holy river Bagmati at Pashupatinath, with burning ghats similar to the Ganges in India. Or we can visit the Buddhist temple of Swayambhunath and explore the temples in the city of Patan. Depart Kathmandu and fly home.